The brand new 600-passenger vessel Enhydra is the largest lithium-ion battery electric hybrid-powered vessel in North America built under "USCG Subchapter K" certification. 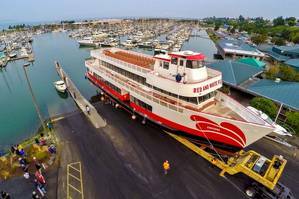 The recently launched 128-foot LOA aluminum monohull vessel was designed by Nic de Waal of Teknicraft Design in Auckland, New Zealand and built by All American Marine in Bellingham, Wash. for Red and White Fleet of San Francisco, who will use the vessel to provide harbor tours of San Francisco Bay and the Golden Gate Bridge. The Red and White Fleet team had initially pursued construction designs for steel monohulls for their new vessel, but opted for the aluminum design after All American Marine demonstrated considerable savings in building and maintenance costs while ensuring delivery of a robust hull structure. Founded in 1892 and one of the oldest businesses operating in the San Francisco Bay area, historic Red and White Fleet is committed to environmental sustainability and community education. The Enhydra will not only be more sustainable in fuel consumption, but it will also lessen impact on local marine life. When powering the vessel, the electric motors are noticeably quieter, resulting in less noise and vibration, and a significantly reduced environmental footprint overall. The Enhydra is a pioneering collaboration. "We are proud to introduce such a large-capacity hybrid technology vessel and working with such great partners such as Red and White Fleet and BAE Systems to develop and build the boat of the future," All American Marine CEO Matt Mullett said. "All American is working to stay at the forefront of the decarbonization movement in the maritime industry, and the lithium-ion hybrid electric propulsion system on the Enhydra is a step in the right direction." All American Marine partnered with BAE Systems to design and integrate the complete electric hybrid system. BAE supplied its HybriDrive propulsion system that includes a generator, propulsion power converter, house load power supply and control system. The generator is mounted to a variable speed Cummins QSL9 410 mhp diesel engine. The system offers parallel hybrid powering of the AC traction motor from either the generator, the batteries or both. The motor is coupled to the propulsion shaft via a reduction gear for thrust and increased propeller efficiency. AAM said that with this configuration, torque is immediately available for the propeller, and the speed can be precisely controlled. BAE Systems' HybriGen system has lower engine operating hours and is more streamlined than a conventional drive, requiring fewer parts, thus resulting in savings in both fuel consumption and maintenance costs. The hybrid system also uses battery power from two 80 kWh lithium-ion battery packs from Corvus Energy, which are supplied under their next generation Orca Energy line. Inherent in the Enhydra's design is the ability to expand the size of the batteries to reach complete zeroemissions operations in the future as charging infrastructure advances and battery technology improves. This current battery system can meet any power demands of the Enhydra. Simultaneously, the propulsion system provides a silent, emissions-free experience for recreational cruise excursions. The BAE HybridDrive system can automatically use full electric battery operation at slower speeds and when maneuvering in and out of the harbor with the Enhydra's two Veem Star four-blade props. At higher speeds, the generator will automatically engage and augment the additional power demands of the traction motor. The innovative design and quality construction of the Enhydra make Red and White Fleet's Vice President of Operations Joe Burgard hopeful for future possibilities. "We are very pleased with the team All American Marine has put together to deliver this unique vessel and are eager for our guests to experience San Francisco Bay from the silent decks of the Enhydra [this fall]," Burgard said. "We see the propulsion configuration on the Enhydra as phase one in our move toward the full electrification of our fleet. Stay tuned for phase two." Guests on board the Enhydra can experience views of the bay and cityscape from all three decks, each complete with their own convenient snack bar. The second level offers a full, wrap-around viewing deck with access to the enlarged-bow foredeck. Entirely open, the top deck offers ample outdoor seating for those on board.